This is the ideal place if you’re looking to get away with the family or a larger group. This was perfect for us, as we were quite happy to be left to our own devices and enjoy our time. The cottage is stunning and the owners are more than happy to help with anything. Our group was celebrating a hen do and so we celebrated through the night with no issues. The cottage is located in an ideal location to go for walks and to enjoy the views. Great addition with the fire pit too! The rooms were impeccable and faultless and the kitchen provides everything you could need! We stayed in March- 8 adults and 7 kids. The cottage has plenty of rooms and the facilities are great. Woodpecker has a huge kitchen living space, and a lovely garden out front with swings and a tennis court. The cottage was clean and nicely decorated. We had a wonderful time! A beautiful big cottage perfect for our family celebration. Woodpecker Cottage is a beautifully presented large cottage finished to the highest of standards. The open plan kitchen, dining area, living area and conservatory was perfect for our large family party to socialise altogether. The bedrooms and en-suites were spacious, clean and very comfortable and although we didn't need them, two of the bedrooms had disabled facilities. Our hosts Sue and Kendal were so helpful and welcoming, showing us all we needed to know and leaving us a huge delicious cake! Our party made good use of the tennis court and fire pit while we were there and we took off on a walk one day to the lovely Apple Store Cafe at Wyresdale Park which was recommended to us. There is plenty of information in the cottage and on the website on the area with ideas of what to do and where to go which was very handy. 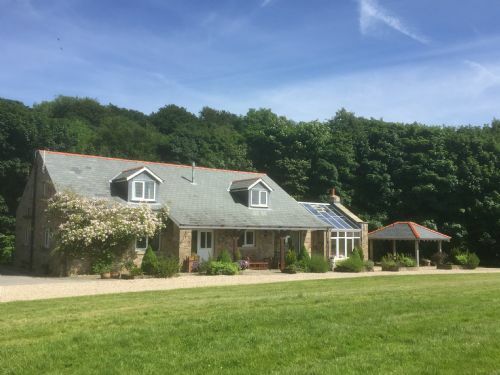 I would not hesitate to recommend this property and also any of the other properties at Barnacre (we also had The Piggeries Cottage which was stunning) and will definitely be heading back again in the future. Thank you so much Sue, Terry and Kendal. 13 of us stayed here for a 30th birthday weekend and we will most definitely be returning! The conservatory and living area are all open plan and far more spacious than the pictures suggest. We had 13 people in the conservatory with the fire roaring and everybody comfortable. Can not recommend enough! Inviting. Terry and Sue made us very welcome and we were particularly delighted with the delicious sponge cake supplied by Sue.. I cannot recommend this cottage highly enough. Wonderful. Had a wonderful few days with my family. Our christmas day was perfect. Plenty of room to relax and the children had room to play. The views are lovely and we went on a few local walks as a family and smaller walks with the children. Would love to do it again. Just had a fabulous stay at Barnacre cottages for my sister's 50th birthday party! Real home from home and the Woodpecker cottage is a definite party house! Would recommend these cottages without hesitation! Bsrnacre Cottages are really special and we return year on year. Woodpecker is very big, well equipped, immaculate condition with beautiful views. Big comfortable beds, lovely towels and elemis products highlight the quality of the accommodation. The owners work hard and make you feel so welcome. We were greeted with the biggest home made cake you could imagine and baked to perfection! See you in 2019. In between Garstang & Scorton - both good places with plenty of walks, this is an excellent location. Wonderful views to the coast and on a clear day -The Isle of Man. The house was well equipped and very warm. We were a big family group - all adults - and had everything we needed. We made use of the Tramper all terrain electric scooter and went to Scorton - this was great day out for us. It brought us all huge pleasure and made some wonderful memories. Terry & Sue are wonderful hosts - everything you could want is there and I would recommend it to someone who wants a relaxing time. Excellent stay for disabled and Carer’s of all ages with all kinds of disability. What a fantastic find ,so pleased we found this property . We were getting together for a large family weekend. This property was just perfect. The bedrooms were great,big family rooms. very private and safe . Great location. The owners couldn’t have done enough. Very good communication.